Extreme heat resistant barcoded labels and tags. 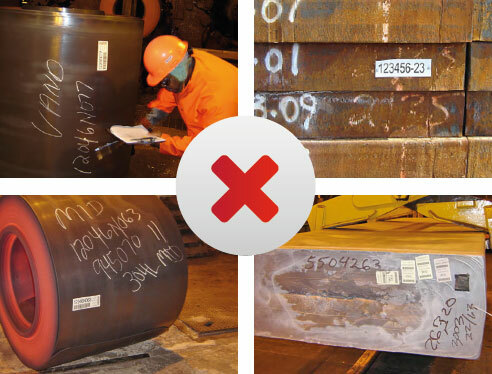 Our Heatproof product range enables metal producers and re-processors to track and manage throughout the supply chain with consistent and efficient product identification. All these benefits combine to help minimise the risk of potential liability issues and maximise the reliability of your business’s operations. These revolutionary Heatproof labels and tags withstand harsh outdoor environments, chemical exposure and can be used in temperatures up to 1250°C. Recognised worldwide for their robust durability, and excellent high resolution thermal transfer printing, this product range is also cost effective. runs the potential risk of recall and liabilities”. LINTEC EUROPE (UK) LTD take a ‘can do’ approach to your requirements, underpinned by our extensive range and knowledge of components – including surface coatings, films, adhesives and liners. If our existing solutions can’t meet your needs, we’ll aim to develop one that does.